I’m getting some serious Airbender vibes from the trailers for Lego Elves: Secrets of Elvendale, a Netflix original animated series premiering next week. It’s not very Lego, but I like what I’m seeing. Despite eschewing traditional blocky Lego minifigures in favor of tiny, spindly-limbed plastic dolls, Elves remains one of my favorite ongoing Lego lines. It’s got amazing colors not often seen in traditional Lego sets and a very distinct fantasy style that uses shapes and decorative swirls to outstanding effect. 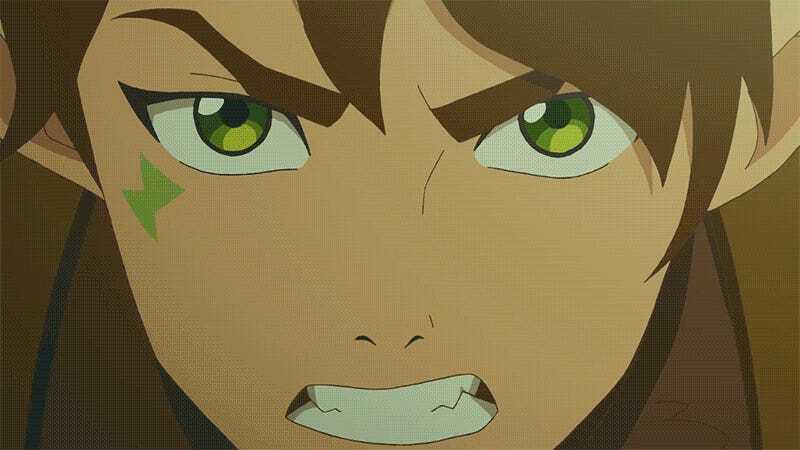 Rather than going for a look evocative of the toys, Lego Elves: Secrets of Elvendale goes for hand-animation in the style of shows like The Legend of Korra. It works really well. The series follows Emily Jones, the human character who stumbled into the land of the Elves in the first wave of building sets, released back in 2015. Her younger sister Sophie follows her on a return trip to Elvendale, only to be captured by the Goblin King and his minions, as introduced in this year’s line of Lego Elves building sets. Emily must team up with her magical elf friends to rescue her sister and free the goblins from their tyrannical master. Lego sent three sets, which arrived yesterday afternoon. There was no way I could build all three. Let’s take a closer look at one of the characters from the animation still, fire elf Azari. While the lanky figures are growing on me and I love the little chompy plant thing, I’m very happy with how animated Azari turned out. Hopefully she still gets to ride her chariot. Going with the animated style was a very good choice. I’m glad to see Lego Elves thriving. I’m also glad to see the building sets moving from the “girl section” of store shelves into the main Lego aisle, something I noticed during a recent trip to Walmart. And I can’t wait to see Lego Elves: Secrets of Elvendale when it arrives on Netflix September 1.